This past week I was shooting an ad campaign in Milan. While I was searching for a location on a very quiet residential street near Parco Sempione, this man, a Sartorialist All-Star, just happened to pop up on his bike. This must have been fate because the street was so quiet. I didn’t have my regular camera, since I was riding around on the back of a Vespa. However Emanuele, one of the production staff, had his tiny point-and-shoot so I rattled off a few shots. It has always been so random when I run into this gentleman and yet always quite inspiring. He’s so sporty, chic and, of course, always with his bike. When we got back to the trailer I told one of the other production people about seeing him again, and she’s now convinced that he’s my guardian angel! But his sunglasses! They are perfection! All over-sized glasses suddenly and definitively passe. If I can look half this good when I'm this gentleman's age, I will have reached Nirvana! There is something extra admirable about looking so chic while you're on a bike; it makes your style seem even more natural and effortless. He looks great. I love his color combinations and the cut of his pants cuffs. You definitly like people on bikes. Who knows, your gardian angel my be a biker!!! I cannot comment on his being your guardian angel or not, but I really like his choice of colours! Stylish Gentleman. Love his shoes and the length of his trousers :) His spectacles are cute too. Definitely see why you call him a Sartorialist all-star. He has amazing sense of style…and I love his beard! Hehe. He represents that wonderful Milan style I always think of when I look back to my long-ago trip to Milano in 1992. Everyone looked so effortlessly chic – an inspiration! 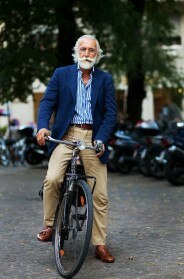 I think we in the comments have mentioned before how great a Sartorialist 'Style on Bikes' book would be …. Perfection! piece of clothing is the perfect cut and color to compliment the whole. I particularly LOVE the tapered jeans and loafers. This man looks far too much like Santa NOT to be. Every time he pops up in one of your shoots I end up smiling. what point and shoot did you use to take the shot? These old italian man have something magical. They're tradition and classicism and they looks always perfect. Italian style. Cool! I hope to look close to this when I get to his age! Ernest Hemmingway, is that you?? Milan outfitters of all ages always have something to say, love them! I really like his jacket and how he manages to wear his sunglasses. 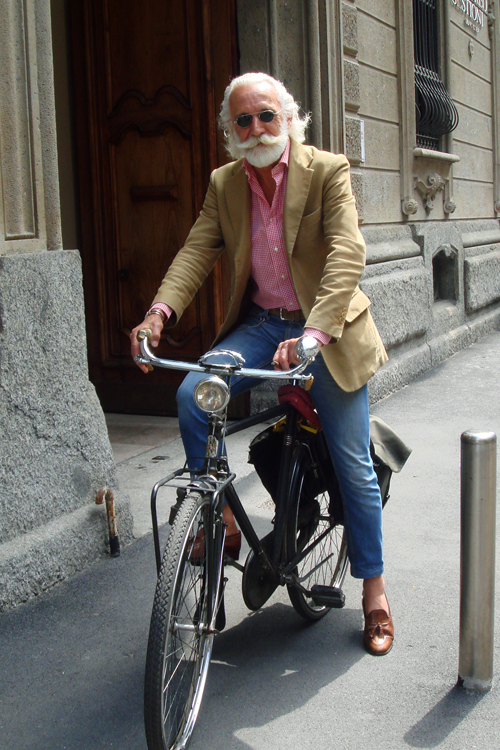 i saw this gentelman the same day, he was wearing this outfit and actually riding his bike at porta ticinese. and i was very impressed about his looks and i admired his energy. you can tell from this look that he is a life lover. OMG!!! !Buffalo Bill has been reincarnated and gone to Milan !! To me, what makes him so chic is the way he sits nonchalantly on his saddle and wears non-sport clothes to ride a bike and the perfection of his flawlessly white hair and the "old money-classic basics" quality of his shoes. I can't help but wonder where he lives and what he does apart from riding his bike. He is a perfection! Of course the bike is a must. I do hope he is your guardian angel and we get to see more of him in your random run-ins. A trim Santa in stylish summer gear! He is gorgeous. He is cool angel,alike Santa Claus…but no smile!! Italian guys style is insane. I love the jacket and the shirt. I love this look, the small sunglasses, the burly beard and mustache, the longish hair, as if to say, I'll do as I please. And then the effortless look of the tattersall shirt and the tan jacket with jeans. Do you need an extensive wardrobe to achieve this? who wouldn't love the idea of a guardian angel and of course yours would have to be the most chic angel ever. soooo stylish and I hadn't to read the head-line to know that his Italian:)yeah,Italian style! Why oh why don't they make men like this in America — and, more specifically, in Boston?! THIS, folks, is a man. What a handsome looking gentleman of a certain age. I love the little details like the glasses and the shoes! This is one of the reasons I just love Italy! The people are amazing! Fantastic … and on a bike! Perfect! I wish I'd know somebody looking as good as this man is. "Guardian Angel" or 'Stylish Gentleman" so we can wee all of his photos together, please! That is so cool Scott. I wonder if someday you will use your "friend" in a magazine shoot. I can picture him riding his bike with a beautiful model on the handle bars, her head thrown back laughing, hair blowing & a long skirt flowing in the wind. Absolutely stunning man. So chic. i wish i could run into such style every day. from head to toe he is screaming it. But you are a guardian angel…. The true style guardian!!! I really love the mens' style that you have been posting for the last few days – tailored, effortless, clean. I hope that I can learn at some point to translate what I love about menswear, into my own style, without seeming masculine, only stylish. From his majestically grooved beard to his wonderful loafers. WOULD LOVE TO SHARE A GLASS OF PERSECO WITH HIM AND HEAR HIS STORY…. Love the fact that he's smoking a cigar – looks like he's enjoying life. I live in this street! His smiling mustache makes him seem so amicable, his well groomed style so intelligent… what a gentleman! He's perfection. He looks so effortlessly chic. Seeing him on the street would definately make my day! He looks great, but a REAL gentlemen in town always wear SOCKS!!!! Oh why don't I ever see men like this? Instead I see sneakers, ill fitting tee shirts, overhanging bellies, and generally slovenly looking men everywhere. Sigh…take me to Italy, please! "I die"! Mamma mia. My absolute style pecadillo is a man with italian loafers and no sox. Does me in! that's just a bonus in his case. i've missed his gougeousness on his bike and fabulous, impeccable…yet easy, natural style…similar to the "white knight in firenze… oops,I mean "heat" ;-)! again that killa' Italian DNA. DEar Sart and fellow Sarters, how 'bout we have fiction contest where we create fabulous stories around these Milanese style icons? I never ever tire of seeing them, and find myself fantisizing about their lives. I believe I read somewhere that this gentleman is overseeing the latest top secret Michaelangelo restoration at his lake house on Orto….his accoustic guitar rhapsodies melt the heart. He is very kind to anumals. Tonight he is dining with Miiucia and usual suuspects under the wisteria laden pergola at the family villa… Okey dokey..You talented writers, feel free to pipe in anytime here! thanks Sart..like you, seeing "Mi angelina"
it's so amazing to see him here AGAIN!!! he is incredible! I didn't know guardian angles rode up on bikes! Yikes! Wow! this is THE cool man! I love him better than that SUSPENDER-size-not-so-fit man! Maybe he really is your guardian angel. The fashion guardian angel. It would be so great if I were to meet him. That's one of the reasons I love living in Milan: Everybody has a sense of fashion. I mean where else would you find an older guy on a bike dressed like this?! he looks like santa in daylight! Seriously though, the fit of his jeans is fantastic. The color of jacket is wonderful. (Khaki with mustard overtones.) Have always liked this color. Wish there were a name for it. If you cover his head/beard with your finger, he could be 30-something. Nice to see an older gentleman looking so fit and vibrant! Everything about him in this pic is fantastic! He is a magnificent bearded ray of sunshine! love the facial hair! and nice shoes! lovely little story,try and make friends with him the next time! He looks like he can sit next too you and talk to you all night long about women, philosophy etc. without becoming boring. I love this. I especially love that his beard is groomed into perfection. This is kind of what I want to picture my dad as when he says he?s going out, but then I realize that it is a rare man who can look THAT spectacular in a mix of clothes that might be older than I am and new(er) + versatile pieces. I L.O.V.E. this photo. Could look at it all day!!! Happy o so very happy to see this pic! Growing up can be beautiful x I love a guy on a bike. Shoes and sunglasses are the key. Great stilish man! His mustache is magnificent and his beard is perfect! The guy is in a perfect adequation with his bicycle! Look the sunglasses and the light of the bike: same shape! Great beard. I'm going to try and get mine like that. I had scrolled down a little too much when I first looked at the photo, and only saw it from the waist down. I was actually convinced that it was a woman. A very chic and stylish woman. I've been looking for shoes like this for months now, and I'm starting to think.. I might find them in the men's department! This young gent is awesome! Love the tassel loafers that he often wears. I've had a pair of these shoes for a number of years and think they're fabulous. I bought them at Celine in Paris and don't wear them all that much because they are a teeny bit tight. On the sole it says they were made in Italy. I wonder who made them. Wow! I wish that was my grandpa! Like your co worker said, I also think he is a kind of guardian angel of all of us, fashion lovers! Marvelous rose shirt!!! You have a very elegant guardian angel indeed! And his beard is so well groomed! That is such a happy coincidence! He really does have amazing style — love his round sunglasses and white beard and hair! I can't stand it when men color their hair… white hair gives this gentleman such a personality! He looks like he should be a famous novelist or something else creative! When I go to pick up my kids from school I short cut through a very quiet neighborhood, boring nothing special… you get my drift. And for some reason I always see, there, of all places very interestingly (dressed) looking people. I can never stop because I'm rushing, but maybe I should passing by a little earlier. You never know… As you've pointed out your self. I Love men in loafers without socks!! So chic!! Also loving the metal bangle resonating with the shades. And what appears to a perfectly flat stomach. Impressive! Does anyone know what kind of bike the dude is riding? Aristocratic &sporting.It's the perfection of the classical combination of blue-white-red.In this case with the snow white beard.He has something special that goes further then a just classical/boring image of blue-white-red. Perhaps an homage to Krzysztof Kiezlowski's trilogy "Bleu","Blanc","Rouge" and the revolutionary ideals of liberty,equality and fraternity. he must be an amazing character. I'd love to chat with him some time. I've been trying on all different varieties of Levis endlessly trying to find a pair with a fit like that. Anyone have any reccomendations, levis or otherwise? I don't think he's your Guardian Angel… I think this is what God looks like when he turns up to greet you – well dressed & eco-friendly. Fabulous beard & Lennon-esque sunnies. Class. he is your own Santa!! This man has GREAT style. Love it. Definitely Guardian Angel material there. And not just a Sartorialist all star but a beard and mustache all star as well! I love this outfit. Very nice indeed. Love his clothes, yes, but really love his bike! Anyone able to identify it? Cooler than cool; except for the shoes! Yes indeed, he is quite cool for his age. He seems like a nice guy. I love his mustache. Hahaha… even your guardian angel is chic. Can you imagine? Fabulous! And how does he keep his beard looking so…perfect? Perfect jeans, perfect shoes, great beard – which barber-shop does he go to?? – making a unique look. I LOVE THIS GUY! Santa unplugged. Damn the reindeer, it's hot and they have to take a vacation too! such a handsome man. the beard looks lovely on him, but i'm so curious what he looks like without it. it'd be hard to shave that pretty work off, though. Perfect. Love his jewelry and belt. Love the cut of his jeans and how they just slightly taper at the leg. He is well-groomed and alluring in a non-ostentatious way. The bike is a classic rod-brake roadster. Nearly identical ones are produced over the world. Eastman and Flying Pigeon brands from China are perhaps the easiest to obtain. How stylish! And such perfect beard! guardian angel… or he spends hours getting dressed every morning he knows you're in town, follows you to quiet streets, and then c a s u a l l y bikes past looking fantastic. hm?? So on point. His tassled loafers are brilliant (sans socks of course). I want to stroke that beard! I read your post, went out and saw him on his bike in Via Torino. And I could not take a photo! sure it's not santa on vacay? Is there no end to this guys coolness? He's smoking a cigar! I want to look like this guy when I'm an old man. What a Beard! i feel very positively about this picture. He looks so cool. It pleases me to see someone of that age still so into dressing smooth. What a class act. I would love to meet this man! I love his look. It looks so familiar. Inventors and scientist in movies always have this look. Well the glasses and beard anyways. This is my favourite photo of the week. This man's got it goin' on right down to his snowy well groomed beard. Love it! This is fantastic! What a character. Rob Forbes, founder of Design Within Reach, just launched the bike company PUBLIC (www.publicbikes.com). The goal, aside from selling bikes, is to get more people like your guardian angel on bikes making our streets safer, sexier, and more fun. i want to be this guy when i grow up! AMAZING STYLE! I wonder what he does for a living! 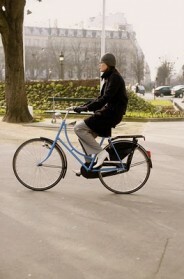 Why are bikes so much cooler in Europe? This man defines style. i'm in love. I am aspiring to have facial hair like this!!! so cool ! I love your blog. Mr. Ötzi! I love it! A picture tells a thousand words, and these thousand words were exactly the ones I was looking for…http://theneave.com/addinginsult2fauxpas/. Thank you for the brilliant work! He looks like pringles so cute!! I know thi gentlemen, his name is Francesco Maglia and he owns and manages the oldest umbrella factory in Milan. His umbrellas are as fashionable as he looks. Proof positive style doesn't know age. Must be the same man as in this image. If I were an old man, I would want his facial hair. He's got this cool eccentric old man thing in the bag. 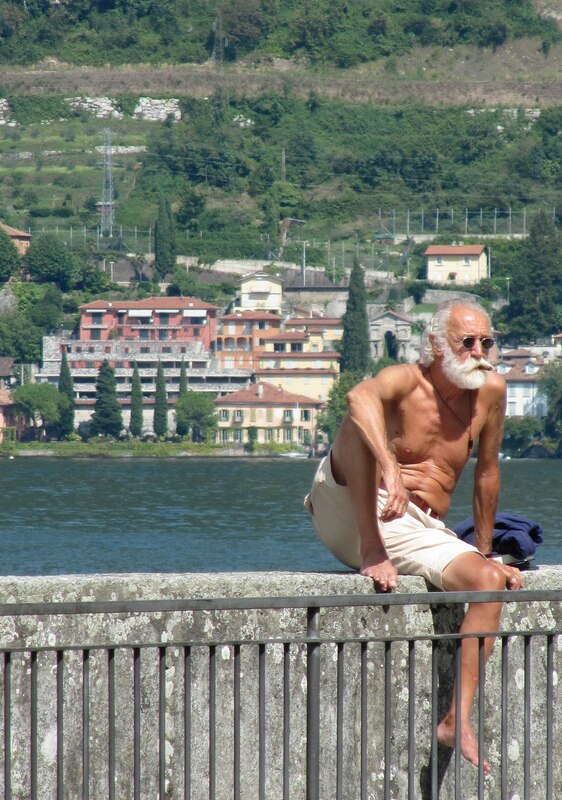 I think I accidentally photographed him last summer in Bellaggio. Ah such comfort for the eyes! I created a bookmark folder just for him, and others like him. They are like a facelift for my soul.